Ford trucks have been very popular vehicles over the years, and the 2013 Ford F-150 is no exception, having sold more than 600,000 F-150s in 2013. In fact, the 2013 Ford F-150 was rated number three out of all of the full sized trucks for the year by Edmund based on its reliability and safety information, as well as being rated a Best Buy in its class. 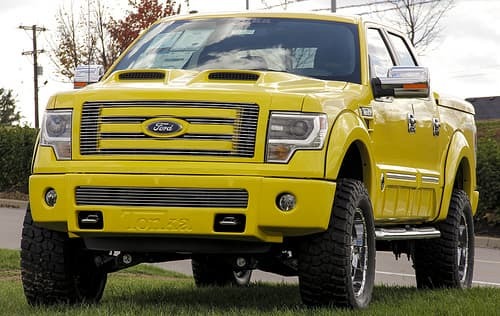 Consumer Guide of 2012 printed that the 2013 Ford F-150 was best in its class due to the fact that the 3.5 liter EcoBoost V6 engine was not available on any other truck in this class, plus the fact that it had particularly good body style, bed length and powertrain. Just one reason why everyone who loves trucks, seems to love this Ford F-150 model of truck. Truck lovers who desired a full sized pickup truck in 2013 turned to the F-150 for many reasons. One of these reasons is that it has four different engines to choose from: basic V6, turbo-charged V6 and two different kinds of V8 engines. These could be paired up to a six speed transmission and a two or a four wheel drive. It was all up to the consumer to choose his favorite. In contrast, with only one month of the year 2013 to go, Ford has already announced that there will be 10 versions of the 2014 Ford F-150, thus giving potential customers even more options than ever before. The 2014 will also have several other upgrades that truck lovers will get to see in January 2014. Plus, the 2013 Ford F-150 was rated above average for safety in its class of vehicles, which is a great statistic for anyone who wants to buy a reliable truck. Plus it was one of their first to optimize and improve the MyFord Touch entertainment system that even included making it possible to use this year’s model of F-150 as a mobile Wi-Fi hot spot. Ford’s F-150 is a very versatile truck and has been used for everything from hauling to farming to construction work to the average citizen using it to have fun on the weekends or to carry things home from the store. Whatever the future holds for the upcoming model of the Ford F-150, they will still remember the ones that have gone before them as being a great model of a truck.